We don’t know much about cashew nuts. Have you ever wondered why they’re so expensive, or why, unlike almonds, walnuts or peanuts, you cannot buy them whole, in their shells? In the Philippines, small producer of those precious nuts, they can be observed closely, and they are in fact very surprising. We buy bags of cashews, but we don’t really know what happens before the bag. So the first time I saw a whole cashew nut, I did not understand what it was. And I had no idea they were dangerous. I’m telling you, cashew nuts are crazy, we just have no idea. So, a whole cashew, what does it loook like then? Well it looks like the first picture at the beginning of this article. It was picked from the tree just for you, with its fruit and its shell. I know, it’s a bit disturbing. Today, we’ll learn a ton of stuff. Let’s go. Cashew nuts like it here in the Philippines, and more precisely in Palawan, where 90% of the national production is made. 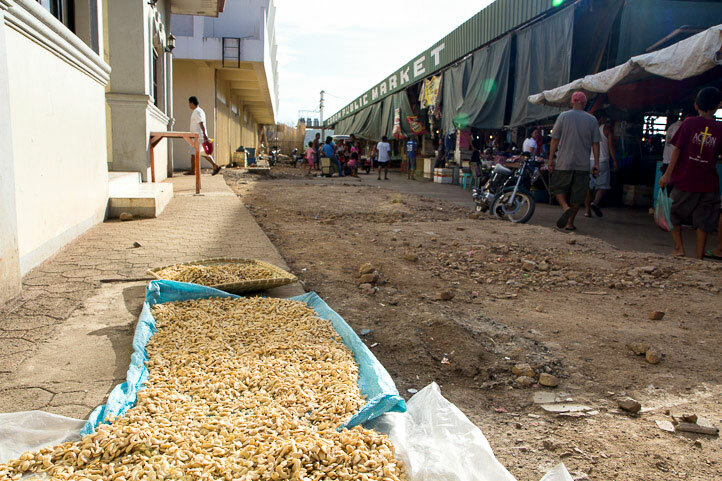 The Philippines export 7,000 tons of cashew each year, with kernels and processed, according to the FAO. The main buyers are India for the whole nuts, and France for the processed ones. It seems like a tiny production to you? It is, the Philippines are far behind Vietnam, first producer in the world with 941,600 tons, Nigeria (636,000 tons), India (573,000 tons) and Brazil (236,140 tons). To produce so many of those nuts, those countries are litterally covered with cashew trees. There are 33,900 sqkm of those plantations in the world. Which means about 0,0227% of all land on the planet is dedicated to those nuts, including deserts, Antarctica and eveything else in the math. It’s a lot. The main reason is that each tree gives only 200 to 300 nuts a year. The yields are low, and more particularly in some countries like India, that dedicates a huge surface to those trees. Far from the first world producers, cashew nuts come originally from South America, in the Brazilian Nordeste. The were cultivated by the Tupi Indians – yes, the same guys we talked about for the Jerusalem artichoke, they really had cool crops. They called them acaju. It means “nut that produces itself”. Indeed, if the climate’s good, there is not a lot to do for those trees. The Tupi were just letting their acaju produce itself in peace when the Portuguese arrived, tasted the nuts and liked them, and decided to take them to another territory of theirs, India. They first made a quick stop in Mozambique in 1578, then headed to Goa. From there, cashew nuts spread throughout South-East Asia. And from Mozambique, it also spread throughout Africa. So cashew grows extremely well in places with an adequate climate, but that’s all. 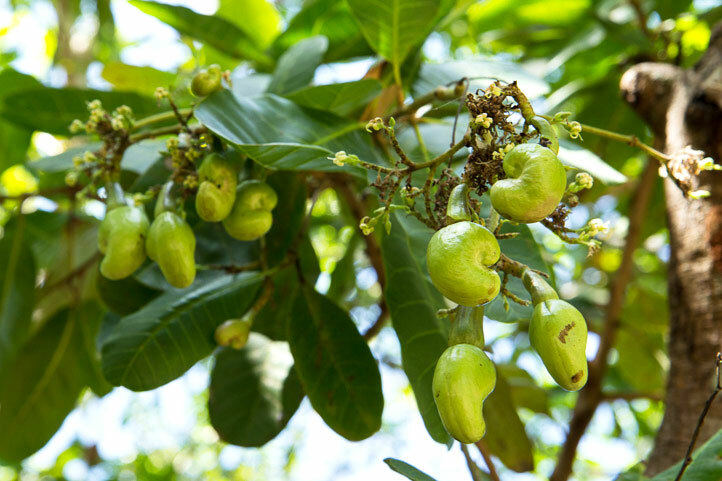 Only 32 countries in the world have cashew trees. That’s it for the history of cashews. Now let’s look at them closely. They’re not nuts in the botanical sense, but seeds, and even better, achenes. It’s a simple dry fruit produced by a flowering plant. 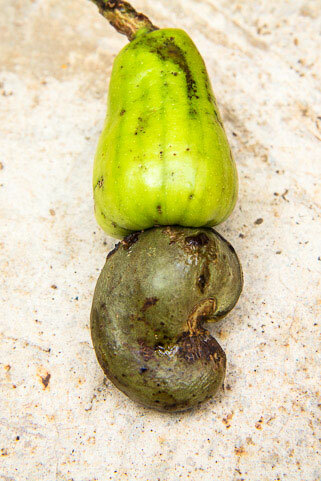 In some cases – and it’s the case for the cashew – an accessory fruit develops from the pedicel and the receptacle of the flower. It also happens with strawberries: what we call strawberry is actually an accessory fruit on which you’ll find achenes, which are those little things that look like seeds. So, for the cashew, let’s be clear and make things simple: the achene is the whole cashew shell, containing the seed, and there’s also a fruit, that we’ll talk about later. Cashews are relatives to mangoes and pistachios – yeah, weird family – and grow on evergreen trees that never grow really high. Their leaves are thick and bright pale green. 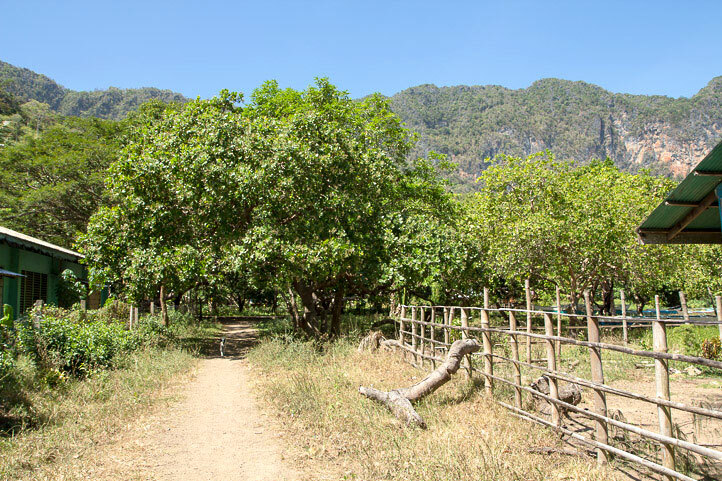 In Banuang Daan, my village in Coron, North Palawan, cashew trees are everywhere. The island is covered with them. Usually their size doesn’t exceed 10 to 12 meters in height but they can have a huge circumference. Short with complex shapes, those are trees made to be climbed. 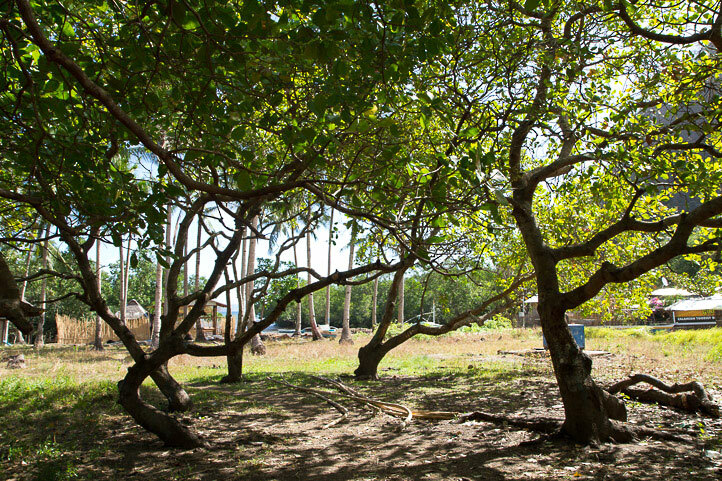 Just for the record, the biggest cashew tree in the world is in Brazil, and covers a surface of 8 400 sqm. In the Philippines, the cashews are harvested between February and May, sometimes June, which are the summer months. They are picked from the ground after they’ve fallen from the tree, so no one climbs those trees, even though they’re made for it. Usually in February the cashews are already ripe, but it’s not exactly the case right now, this year they’re a bit late. But we can already watch what they look like. Follow me, let’s climb those trees. On the tree, the little blossoms are replaced by nuts, well, achenes, that grow into grapes, like cherries. In early February, the shells are still pale green, and they are not hard yet, so they can be opened without any tool, just with the fingers. Only two weeks later, the colour and the texture of the shell have changed a lot. It’s turning brown and hard. But the biggest change is the accessory fruit. It was hardly visible two weeks ago and it got much bigger, even if it’s still not ripe, as you can see it is still very green. This accessory fruit is an apple. Not a real apple of course, but a cashew apple. It’s edible, it’s even good, very good. On my tree, the apples are still very tiny. In one month, they will grow quickly and get huge, much bigger than the shell of the cashew itself, and take a nice colour, red or yellow. Cashew apple is juicy, sour, and it tastes a little like mango. It makes a fantastic fruit juice. In some countries, people even make alcohol with it. So how come we never see it in Europe? Well, because it cannot be exported. It is much too fragile for that. Impossible for it to travel, its extra-thin skin makes it even more delicate than kaki. So either you eat it where it grows, or you can just forget about it. As ridiculous as it may sound, cashew nuts are dangerous. No, you can’t pick your cashew nuts and go sit somewhere to eat them, as you would do with apricots or almonds. Cashew nuts require time, work, and they’ll try to hurt you. 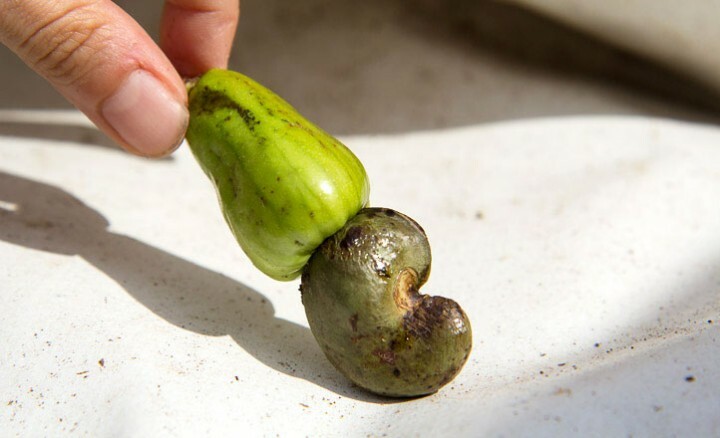 The first time I’ve picked a cashew, it wasn’t ripe, so I opened it, simply pressing it with my fingers. A small white nut came out of it, with a strange transparent liquid. Immediately, my mum Joy told me to go wash my hands: “What are you doing? You’re going to burn your fingers, throw it away!” Yes, cashew nuts are double-dealers. They don’t have one but two shells. In between them, you’ll find anacardic acid, and it will burn your hands. The toxic resin that lays in the honeycomb structure of the first shell is also known as Cashew NutShell Liquid. 70% of it is anacardic acid. 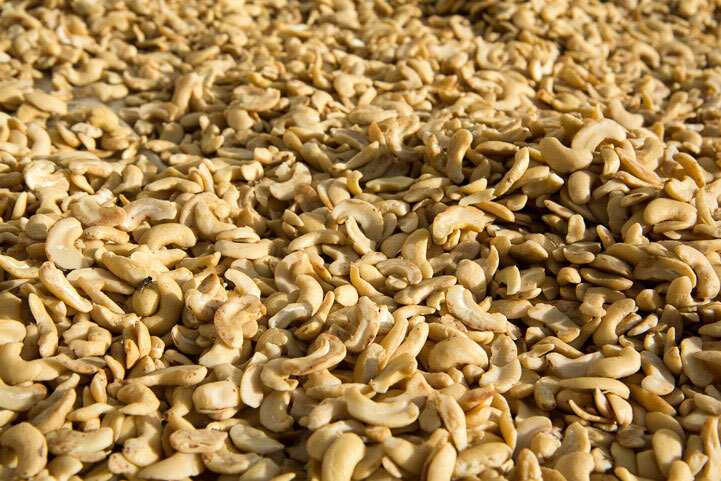 It is sold by cashew producers as it can get a lot of industrial uses. It can make varnish, insecticide, ink, it’s even used to make elements of friction in the automobile industry. If you don’t roast or fry your cashews, you might also get your mouth burnt. But be careful, do that outside. Or else the smoke will irritate your lungs pretty bad. Pretty bad meaning it’s potentially deadly. So preparing cashews is a tough, risky job, really. I’ll go meet some producers in the coming days to show it all to you. Meanwhile, have a blast with those nicely processed nuts you bought, you’ll see how hard it is to get to this result and you’ll understand why cashews are so rare and so expensive.